Road signs could feature safety messages in foreign languages in an effort to reduce the number of crashes involving overseas drivers on New Zealand roads. The NZ Transport Agency (NZTA) has ordered electronic signs and is investigating ways of translating key messages as tourists continue to feature in a disproportionate number of road accidents in Westland, Southland and Otago. The Government has refunded $578,000 to motorists after overcharging them for their vehicle licences. The vehicle licensing system is supposed to ensure that people who drive the safest cars pay the least in annual fees while those who drive the least safe pay the most. But the car risk data ACC uses is under fire for not being roadworthy itself. A new online training module focusing on safe driving provides offshore travel sellers with the information they need to prepare people for a self-drive holiday in New Zealand. The module, developed by Tourism New Zealand is the latest in a series of modules and was developed in answer to growing concern in New Zealand about the safety of visiting drivers. It will be available in seven languages and includes information from the New Zealand Transport Agency and the New Zealand Road Code. Is your car on the 'top 10 most stolen in NZ' list? The Honda Tarneo has claimed the top spot of car thefts in NZ according to AA Insurance, saying that although the probability of the Honda Torneos being stolen is far higher than any other car there are no more of them on the road than any other vehicle. Following last months news that Honda, Toyota and Nissan cars are being recalled in New Zealand, Honda has added more vehicles to the growing recall for air bags that can explode with too much force. The company said it's expanding a previous recall of passenger air bag inflators from high-humidity states in the USA to the entire country. That will add just over a million 2001 to 2005 Civics and 2003 to 2007 Accords to the recall. The two sedans are Honda's No. 2 and No. 3 sellers so far this year in the US. Self-driving cars could be hitting our roads in as little as two years, once European manufacturers start bringing them to market, Transport Minister Simon Bridges says. He went on to say he "wouldn't be surprised that if in the next two or three years ... there will be those who try to bring them to New Zealand, and good on them...That will be something we need to be ready for." Automakers are facing a delima. New automated driving technology heralds a big change in the way drivers relate to their cars - few features threaten the traditional promise of the automobile - freedom, independence, control of the road - like a computer that can drive far safer and has no qualms about taking the wheel. That has put automakers in an awkward spot to reach car buyers who are drawn to the idea of driving with fewer dangers and drudgeries but are still leery of self-driving technology. Car-makers in New Zealand are recalling more than 50,000 vehicles over a potentially deadly airbag fault. It's part of an international recall of more than 34 million vehicles, due to an issue with problematic airbag inflators which could see airbags deploy with such force that it could send potentially lethal shrapnel into drivers and passengers. Toyota's Mirai (NZ$76,226) is the first mass-market car to run off hydrogen. Due in the US in October, the four-seater can drive farther and refuel faster than any electric car a driver can buy. But the world's biggest car company is placing a risky bet on hydrogen, now sold at only a dozen American fueling stations (10 of the 12 are in California). The type of hydrogen fuel cells that run the Mirai have been repeatedly tried and abandoned by rival automakers, and electric-car pioneers have panned the technology as unrealistic and doomed to fail. Our courtesy vehicles are FREE. We have cars, people movers and vans for you tradies! After 32 years, we're really good at what we do. Your car will be as good as new. 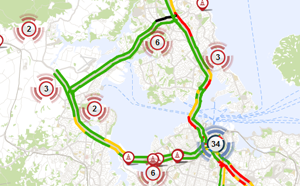 There are some websites that will show you where the trouble spots are around Auckland.